It has been a while since I have performed a wedding. The last time I presided over a wedding was in 2015 for two former youth group members. Both of these weddings went off without too many surprises. That, however, is quite rare. After having performed more than 150 weddings, my experience is that more often than not, things are far from perfect. The cd player doesn’t work. The soloist has a cold. The bride is late. The groom is late. The bride is no longer sure she is coming. The groom broke his nose at the bachelor gathering the night before, and his nose is a mess. The harpist they hired can’t actually play the harp. The groom and his friends have been drinking all morning and are barely able to stand for the wedding. The wedding is on a cliff overlooking the ocean, and a sudden gust of wind blows the music for the whole service including the music stand down to the crashing surf 100 feet below. The food for the reception isn’t ready on time. There isn’t enough food for the quasi-relatives who have crashed the reception. The map on the invitation for the church is incorrect, and folks go to the wrong church. The vinyl record of the wedding march melts in the sun, and so they ask the pastor to play the wedding march by ear at the last minute. Yes, that one REALLY happened - in fact, all of these, and many more I have not mentioned really happened. So as I pondered the passage for this morning, I felt right at home. It sounds as if at least the wedding service itself went off without a hitch-although in those days, wedding ceremonies themselves were pretty simple. Once the bridegroom had his new home ready, he went with his friends to his bride’s parent’s home in the evening. She would have been waiting, veiled and in her wedding dress. In a simple ceremony, the veil was taken from the bride’s face and laid on the bride groom’s shoulder. The problem appeared to occur after the wedding - they did not have enough wine for the guests at the wedding banquet. Now it is believed that receptions in those days lasted as long as a week, so the expectations were high. The new couple and more than likely both families paid for quite a spread. In this case, however, the wine ran out. The party came to a screeching halt, bone dry. Mother Mary saw the problem and went to Jesus - Now we don’t know much about Jesus between the age of 12 and 30. Either he had done some miraculous things on his own, and his mother had seen them, or Mary, who had treasured all the stories in her heart - the angel, the miraculous birth, the announcements about her son, his learning and teaching at the temple at 12 - perhaps she considered all of these things and believed her son could remedy this problem. So she went to her son and said - “They have no wine,” with that look that all Mothers can summon without words, “and what are you going to do about it?” Yet Jesus responded, “O woman, what is that to me? My hour has not yet come.” Jesus was trying to tell his mother in not so gentle terms - the hour of revealing God’s glory had not yet come. And yet, apparently, this wedding reception became the divine instrument, that moment when Jesus revealed his true nature, human and divine. Mary knew bits and pieces about her son’s role in the world, and she thought it was time...Perhaps mother knew best? Or God revealed to her that it was indeed time. So she said to the servants, “Do whatever he tells you,” and walked away. There were six stone jars at the reception, a place where one could ritually cleanse one’s hands. They could hold twenty or thirty gallons. They were for ablutions, holy bathing that preceded certain kinds of liturgies. They were made out of stone because stone would not transmit any impurities, whereas porous clay would. This section is rich in symbolism - The bridegroom is symbolic of Jesus, who becomes the bridegroom for us in Matthew and in the book of Revelation. Bridegroom imagery has its roots far back, as we heard from the Isaiah passage as well, where God in effect marries Israel. The old rite of purifying oneself, washing your hands and arms up to the elbow was one way to ritually cleanse yourself. Jesus used this old rite of purification in a new way- the new revelation superseded the old, and one day, when he hangs upon the cross, a new way of purification and cleansing will arise. The best vintage came last - that is the new wine symbolized the new salvation that comes to us in Jesus Christ, in the latter days of God’s intervention with humanity. However, the main point of today’s story as Jesus reveals his glory isn’t the symbolism throughout-Jesus the bridegroom, a new way of spiritual cleansing, or Jesus the new wine, God saving the best for last. 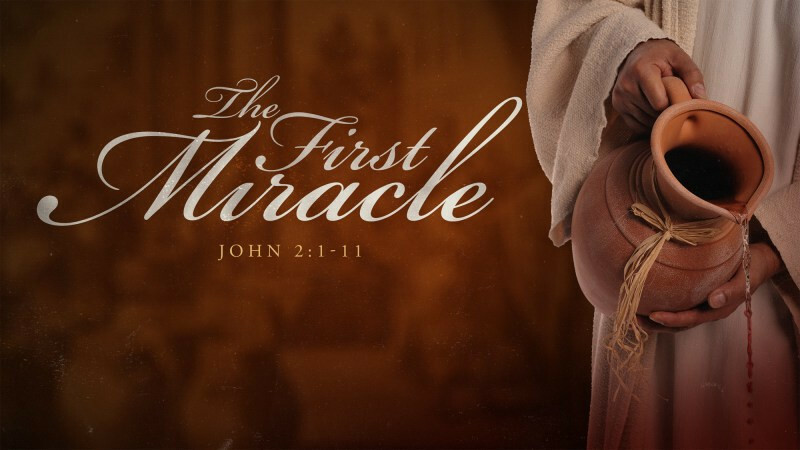 It is that, according to John, this was Jesus’ first miracle, and it came in the midst of an everyday, ordinary moment- at a wedding reception. Now we may pray for miracles at the hospital when a loved one is sick. We may pray for a miracle to occur in the midst of a tense, life-changing moment. Yet here we learn that miracles can come to us in the everyday moments as well. It doesn’t have to be a life or death struggle, an earth-shattering event for God to act in our lives, and this is good news for us all. God can intervene, even in a catering emergency, and provide more than enough, an exorbitant amount! I think we all experienced an everyday miracle last year when we agreed upon painting Calvin Hall and agreed on the color in a matter of about 10 minutes. That my friends was a miracle! And yet, the whole subject of miracles in general causes many people to become uneasy. William Placher explores the roots of that discomfort in his book, The Domestication of Transcendence: How Modern Thinking about God Went Wrong. Placher notes that previous to the modern age (beginning around the 1500s), Christians generally had no problem accepting the miracle stories. But beginning in the modern period, miracles became troublesome because they seemed to run contrary to the orderly laws of nature that were being discovered at that time. Placher observes that the 1600s were a time of extreme upheaval in Europe: constant warfare, various plagues, a mini-ice age, and an economic depression. There was so much uncertainty in people's daily lives that they demanded to find certainty in their religion. As a result, miracles fell into disfavor among many modern Christians, because they apparently ran contrary to the otherwise orderly operation of the universe. There are other problems with the idea of miracles as well, and they aren’t just related to the modern period. There are times when you or I pray sincerely for a miracle of healing or help, and we do not get what we have prayed for. In moments at the hospital, as a loved one is slipping away, or in the midst of a personal crisis, I want some immediate action, I want to see that water change into wine. What do we do when there is no miracle we can see? Our faith is often a paradox- I believe that, while God does not send us tragedy, God allows it. In the midst of that tragedy, I believe the potter remolds and reshapes our lives. As Isaiah 64:8 says about God, “You are the potter; we are the work of Your hand.” In time, we find healing or understand suffering in a deeper way, and our very lives become a walking miracle. We see the world differently. We may not have gotten the miracle we hoped for, but something new and different has come. The miracle we hope for is not always the miracle we receive. I think one of the key issues in today’s story is that Jesus does things within God’s will and in God’s time. There are times when God intervenes, and miracles come to us in small and large ways, and times when it is not within God’s will for a miracle to occur. There are those moments when we finite beings try to comprehend the infinite God, and we fall miserably short in our understanding. There are those times when we pray for a miracle in one form, and it is answered in a completely unexpected way - We ask for water to become wine, and it turns into a café mocha instead. God says to us “My thoughts are not your thoughts, nor are my thoughts your ways, says the Lord. For as the heavens are higher than the earth, so are my ways higher than your ways, and my thoughts higher than your thoughts.”(Isaiah 55:8-9). There is good news for us today - miracles come to us in big and small ways - God cares about those huge moments and the small ones as well, and if it is within God’s will, water can change into wine. A very wise Christian once said, “Life is not a puzzle to be solved, but rather a mystery to be lived.” If we are willing to live in this mystery of faith, we will always know hope. For people of faith, there is no coincidence. French poet Anatole France wrote, "Chance is the pseudonym for miracles when God does not want to sign God’s name.” Miracles do happen. God can bring healing and hope to us in moments of life and death, and in those everyday moments- like at a wedding reception, or a church meeting about painting the fellowship hall, providing in abundance. God cares about our lives, every detail, every moment, and will intervene with glory shining from above when it is needed from an infinite divine perspective. As we go from this place today, may we look for God’s signature upon our lives, in moments large and small. May we live in the hope that God can turn our water into wine, and can sustain, mold and shape us in the valley of the shadow when the water does not change or becomes for us something unexpected. Alleluia. Amen.